3.8 out of 5 based on 31 bloggers and 6 commenters. 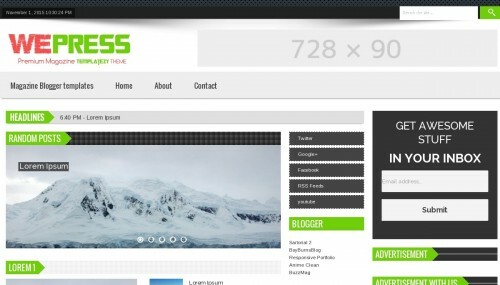 WePress is a free premium blogger template adapted from WordPress with 3 columns, responsive design, magazine-styled, right sidebar, gallery-styled, an exclusive design for Blogger, ads ready, footer columns, slider, social bookmarking icons, posts thumbnails, tabs, breadcrumbs, pagination, a background pattern, related posts support, well designed threaded comments and 404 error page customized. Excellent template for blogs about any general topic, business, entertainment, games, movies, news or photography. In love with this blogger template. And am currently tinkering with it.